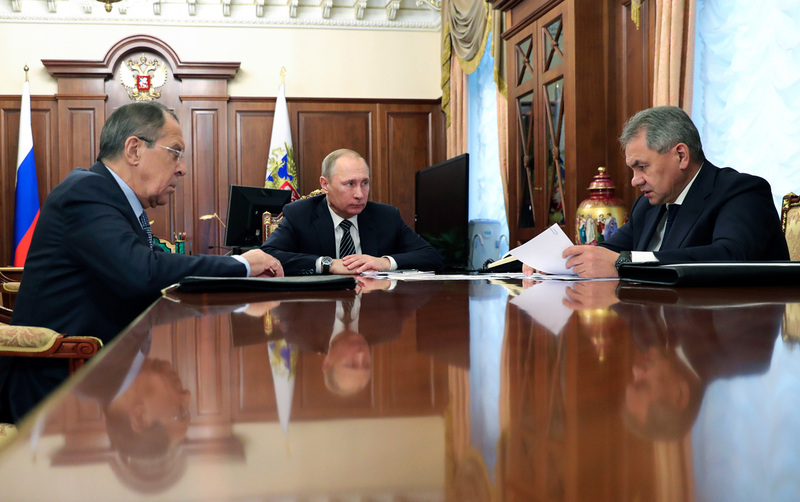 Vladimir Putin and Foreign Minister Sergey Lavrov (L) listen to Defense Minister Sergei Shoigu in Moscow on Dec. 29, 2016. The Bashar Assad government and representatives of the Syrian opposition have reached a ceasefire agreement brokered by Russia, Turkey, and Iran. The parties will cease fire from December 30, and are prepared to begin peace talks. Experts believe that Russia and the region's leading powers may bring peace to Syria, but note that the process will be long, and will require the participation of new parties. Russia and Turkey are the guarantors of the new ceasefire in Syria, which comes into force at midnight on Dec. 30, Russian President Vladimir Putin announced on Dec. 29. Opposition units comprising over 60,000 rebels will join the ceasefire, Russian Defense Minister Sergei Shoigu has reported. Those opposition groups who fail to observe the ceasefire will be treated as terrorists; the rest may expect to enter into dialog with the Syrian government. Iran has also supported the Syrian ceasefire. Putin stressed that Russia, Turkey, and Iran had done "a lot of work" towards achieving peace, including at the December 20 meeting of the three countries' defense and foreign ministers in Moscow. Peace talks between the Syrian government and the opposition are to take place in Astana, the capital city of Kazakhstan, in the second half of January. Regional powers to replace U.S.
Russia's historic partner in seeking a peaceful solution to the Syrian conflict used to be the U.S., but all the previous attempts to bring peace to Syria have failed. The latest ceasefire, announced on Sept. 10, did not hold for a week. This time around Moscow has partnered with Turkey and Iran, both major Middle Eastern players, leaving the U.S. by the roadside. "The U.S. had virtually no levers of influence on the [Syrian] opposition; Washington considered them to be moderates, but in reality, they sided with the Jabhat Fateh al-Sham terrorists," says Irina Zvyagelskaya, senior research fellow at the Institute of Oriental Studies of the Russian Academy of Sciences. Unlike the U.S., Turkey can exert direct influence on the Syrian opposition, so partnering with Ankara would be more effective for Moscow, she explains. Iran and Russia, for their part, can influence Syrian President Bashar Assad, their military and political ally. Leonid Isaev, associate professor of political science at the Higher School of Economics, concurs that the ceasefire brokered by Russia, Turkey, and Iran may prove effective. Not only do these three countries have influence on the parties to the Syrian civil war, they also realize the necessity of forging a compromise. "Everybody needs this lull," Isaev says. "Turkey has been facing serious instability at home while conducting a military operation in northern Syria. Iran has invested plenty of financial and human resources in supporting Assad. Russia has also been running certain losses." In this situation, with both the Syrian government and the opposition lacking the resources needed to win the war, Russia and the regional powers are urging the two parties towards peace. Putin was cautious in his appraisal of the agreements reached. "We understand that all these agreements are extremely fragile," he said. Russian experts agree: there are numerous factors in the complex Syrian situation which are capable of undermining the ceasefire. "There is no confidence in the long-term nature of the agreements," Zvyagelskaya remarks. According to her, it is not just about the contradictions between the ceasefire brokers (Russia and Iran support Assad, while Turkey supports the Syrian opposition), but also about the great number of other players in Syria, including non-government actors. Armed groups, including terrorists, may behave unpredictably, and far from everyone is interested in a stabilization in Syria, Zvyagelskaya believes. Isaev points out that the truce and agreement about delimiting the spheres of influence primarily concern the northwestern parts of Syria, where there already is a certain recognized border between the areas controlled by the government and the opposition. The situation may be more complex elsewhere in the country. "For example, what is to be done about the eastern part of Syria, which is currently under Islamic State control? Who will control this territory, who will liberate it from the terrorists?" In any case, Isaev says, the list of parties to the talks needs to be expanded to include the U.S., Saudi Arabia, and other regional powers. "The trilateral format involving Russia, Turkey and Iran is a good start, but it will not be enough to bring peace to all of Syria. It needs to be broadened further down the road," he added.